First and foremost, the bag looks cool and works well. It is intelligently designed form end-to-end. It feels “long” – both because it is narrow so it needs to be long to carry a good supply of gear, and because it is designed to fit quite a large laptop. Once you get used to the long, narrow, shape it fits and wears well. I like having the flexibility to use the flap or top opening, as well as the easy access pockets on the end and the rear. The separate laptop compartment is nice for making it easy to snag your computer from the bag when it’s stuff into the overhead on a plane. The bag also does a great job of sitting upright. Many similar bags fall over easily unless they are packed very carefully. Open rear pocket for documents, a hat, etc. Stacked front slide pockets for miscellaneous pens, business cards, etc. The shoulder strap is a simple cloth strap (with little rubber nubbins to prevent slipping). It is certainly fine, and probably will last forever, but the lack of padding makes it much less comfortable than similar bags with padded straps. I may “cheat” and take one of the padded straps from another bag to use with it. The bag is fairly heavy for what it holds. Certainly that is part of what makes it so reliable and rugged, but it also doesn’t make carrying it any easier. For comparison the Domke Metro Messenger weighs in at 5.25 pounds, while the Think Tank Urban Disguise 50 (which also holds a 15” laptop alongside camera gear) is under 4 lbs. In fairness, even though both bags spec that they hold a 15” laptop, the Messenger is longer, so it has a more generous laptop compartment. So we could compare it to the Think Tank Urban Disguise 60, but even that weighs in at a lighter 3.7 - 4.4 lbs. The metal snaps for the main cover can be somewhat noisy as you bounce around. Certainly there are modern designs that wouldn’t have that problem, but then again they are really sturdy and easy to snap. The bag does have plenty of modern touches, like removable padded dividers, a “key” leash, and lots of small pockets. 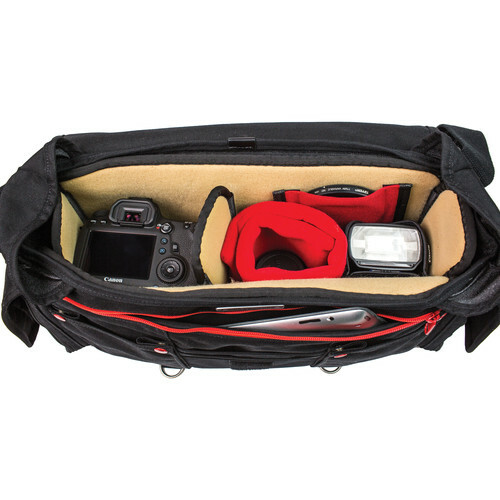 My only problem with the dividers is that while they are flexible, they don’t have any pre-defined bend points the way the ones from LowePro and Think Tank do. Those “easy bend” flaps make it simpler to place a camera body with lens pointed down in the bag and have the wider (grip) side rest on the flap. I think with some work I can accomplish the same thing in the Metro Messenger, but so far I haven’t really mastered that part. Don’t be fooled by the name Messenger, thinking that the bag can only be used as a “messenger-style” bag (slung over the opposite shoulder) like the Think Tank Sling-O-Matic. The bag is equally at home as a shoulder bag (although you can of course put the strap over your other shoulder to use the bag as a sling bag. The bag is available in black, ruggedized black, or “military” (a sort of artsy green reminiscent of the Retrospective bag blue from Think Tank). I liked the green because it is a nice change from the typical black photo bag, and doesn’t look as much like it contains valuable equipment. Is the Domke Metro Messenger bag right for you? If you’re really looking for a professional “briefcase-style” bag, then I can heartily recommend the Think Tank Urban Disguise 60 (or one of its smaller siblings like the Think Tank Urban Disguise 50 if you don’t need all the room of a 60 for a 17” laptop). 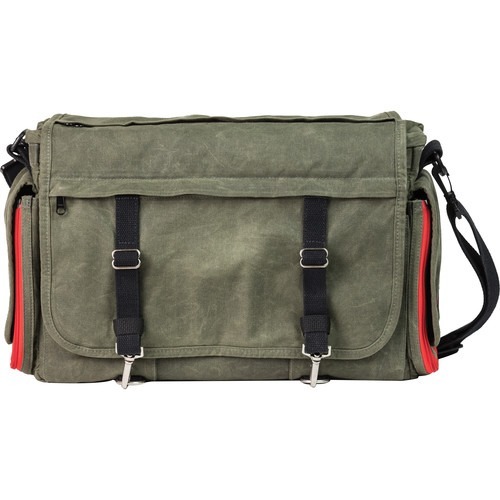 All the rugged glory of the Domke Metro Messenger doesn’t come cheap. The version I think is coolest, the Military color, will run you $349, while the Black is $343, and the Rugged Black is $380. 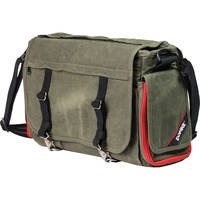 If you’re inspired by the concept but don’t want to shell out the money, you can either look at the Domke Herald (room for tablet only) or the Think Tank CityWalker shoulder bag as less expensive options.